Pu Xinyu, also known as Pu Ru, was a cousin of the last emperor of the Qing dynasty; as such he received a classical education and was able to study at first hand paintings by Song, Yuan, Ming and Qing masters. He remained in Peking until the 1940s, later moving to Taiwan where he became the leading upholder of the classical tradition. 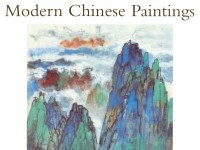 The brushwork in this painting is in the meticulous gongbi style. Pu Ru was a cousin of the last emperor of the Qing dynasty (1644-1911); as such he received a classical education and was able to study paintings by traditional masters first hand. He remained in Beijing until the 1940s, later moving to Taiwan where he became the leading upholder of the classical tradition. The inscription suggests that the artist is imitating the meticulous gongbi style of Wang Hui (1632-1717) in this painting. The application of colour suggests the influence of the blue-and-green landscapes from the Northern Song period (AD 960-1127).